1. Are you new to Instagram, or you’ve already been around for a while? 2. How can your post get featured? Are you new to Instagram, or you’ve already been around for a while? Ether way, you want to grow, strengthen your account, and stay relevant. Hashtags, and getting featured in the trending Instagram hashtags is a big deal. It can result in network viral effect, connect you to new followers and new communities, and make your post go viral. But, how do you get to be featured in the trending Instagram hashtags? What are the factors that Instagram cares about, when selecting which posts are relevant and should be featured? 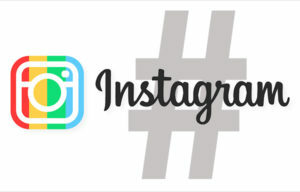 If you search for a hashtag on Instagram, you will see the top nine posts, that had most likes and most engagement,that had that particular hashtag, and under that all other posts, that are in chronological order, and they are constantly updated, as people keep posting. Also, when you browse hastag on Instagram, every Instagram user sees the same posts, in same order as you do, in top posts and in other chronological organized posts. So, being featured in top posts can make huge impact on your brand! What makes a post a ‘top post’? The Instagram algorithm consists on: how much engagement your post gets, likes and comments; the popularity of hastag; and how quickly your post gets engagement. It’s not enough just to take a pretty picture. Hashtags promote it. And, Instagram is not plotting against you and hiding your pretty picture. The Instagram algorithm calculates likes and comments. And, in Instagram hashtag community, your post gets ‘buried’ and stays low in the fed. If you check out some of the popular hashtags, you’ll see that the top posts under that hashtag have 3,000 or 4,000 or more likes, and 100, or more comments. When you post a picture, and use multiple hashtags, your post may trend in some of them. 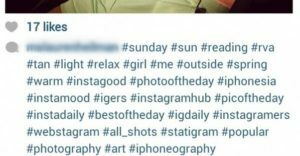 Will your post get on top of the page under hashtags depends on hashtags themselves. How big is the hastag community? How trendy is that hashtag at the moment? Super popular hashtags can be hard to get featured under, because they can be competitive. 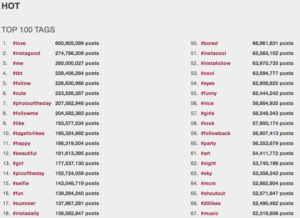 And also, the more relevant the hashtag is, more frequently posts are refreshed. So if you got featured under a super popular hashtag, it can last for only a couple of hours, and under a smaller hashtag, it can last for a day or two. So, use multiple hashtags, and mix popular and less popular hashtags. Both of them have community and audience, and can bring you new contacts. Your post can be popular. And it can also be trending. The numbers make it popular, a lot of likes and comments. But how quickly your post reaches those numbers, can make it trendy. And that’s your growth rate. So 400 likes in 2 hours, can be better than 5,000 in 24 hours. That means that even smaller accounts get to be featured in the top posts. How can your post get featured? When you choose a hashtag, it has to be popular and relevant at the same time. Go for a smaller but still highly- targeted ones. And, use hashtags that mean something to you, because they will bring you closer to your targeted audience, and bring you closer to similar communities, and help you create personal relationships. This can be affected by the fact how often do you post, and when do you post. Be active, post often. And post when your audience is active. The feed is refreshing constantly, so you have to find out what are the best times for posting. Big hashtags are less targeted but generate a lot of likes, and usually have big engagement because people search for the often. Some of those big hashtags are #instagood, #photooftheday, #inspo, #goals, #vscocam. But after ‘big’; hashtags, ad some more personal ones, that are relevant to you. You want to bring interest from people to spend more time viewing your post, and comment. This can also effect Instagram algorithm into getting your post to be featured under top posts for a hashtag. You can communicate by tagging your favorite people, try to have dialog, ask questions. Instagram is about community. You can beat the algorithm by focusing on your hashtag strategy, get more engagement by posting original content, reach out to people when they are most active with most relevant hashtags!